Londonderry-based football coach Gerry Colhoun is to receive a top award from UEFA when he joins the Green and White Army at Windsor next month for the most eagerly anticipated international soccer match in a generation. UEFA’s Executive Committee has chosen Gerry as the silver prize winner in the best leader category in the UEFA Grassroots Week Awards. Gerry was nominated for the award by Kevin Doherty, the Irish FA’s Regional Grassroots Development Officer at Derry City and Strabane Council. Kevin said: “Gerry’s enthusiasm for the game is unrivalled. Whether it’s as a schools coach, administrator, reporter or representative, he always has the player as his number one priority. Kevin explained Gerry introduced the notion of small-sided games at his then club Trojans over 20 years ago when 11-a-side was the norm. He also explained Gerry has assembled a trusted team of volunteers and has encouraged them all to take part in Irish FA coach education. A qualified Football For Peace coach as part of the Gateway cross-border programme between the IFA and the Football Association of Ireland, he is also developing social skills through football to generate understanding within Northern Ireland’s diverse society. 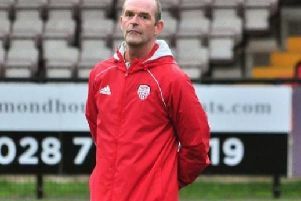 Kevin added: “At grassroots level Gerry works tirelessly for the good of the game. He has been an inspiration. His help and guidance within the local football set-up in the Derry City area has been and remains invaluable. ​Gerry will be presented with his award at the Northern Ireland v Greece game on Thursday, October 8.